The OS211 Series is a range of high quality, low cost, compact sensors which measure the temperature of inaccessible or moving objects and materials. They measure temperatures from -20 to 500°C (-4 to 935ºF), accurately and consistently, with an outstanding response time of 240 ms. Two-way digital communications via a built-in RS485 MODBUS RTU interface enables the user to adjust the emissivity setting; compensate for reflected energy; apply filtering; select maximum and minimum, average or instantaneous readings; and peak or valley hold processing. Up to 32 sensors can be installed on a single multidrop network. All the IR sensors are fitted with precision germanium lenses for accurate optics. These compact sensors are small enough to fit almost anywhere and their rugged stainless steel housings make them ideal for applications where cleanliness and hygiene are paramount. 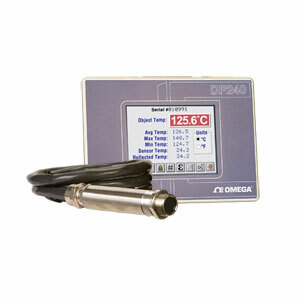 The optional DP240 is a 320 x 240 pixel touch screen terminal with a 89 mm (3.5") color TFT display. It allows the user to display data from up to eight infrared sensors and configure each sensor individually. The configuration parameters include emissivity setting, signal averaging, peak or valley hold processing and reflected energy compensation. There are two versions available. Each one provides all of the features above, however, the enhanced DP240-AR also provides analogue transmission for up to 4 sensors, plus two adjustable alarm outputs per sensor for all 8 sensors. Comes complete with sensor head, 1 m (3.3') cable, USB cable, software, and operator's manual.